Sometime around 1987 I visited the clinic of the late Irie Seiji Sensei, and participated in his study group. That is when I learned how to use “Fukaya sensei’s bamboo tube.” The bamboo tube I learned to use then is shown in Figure 1. At that time I was starting to apply direct moxibustion on Westerners, and I was looking for a way to reduce the heat sensation as well as not leave a burn mark. So the bamboo tube was really a saving grace. From around 1992, I began to progressively shorten the bamboo tube for the sake of patients sensitive to the heat of direct moxibustion. I reduced the open space at the bottom end of the tube down to about 0.5cm, and then I gradually increased this space. Finally, I came up with my revised bamboo tube, 105mm long and closed off 25mm from one end and 80mm from the other. In a way it is a combination of Fukaya Sensei’s A and B type tubes that are shortened and stuck together. 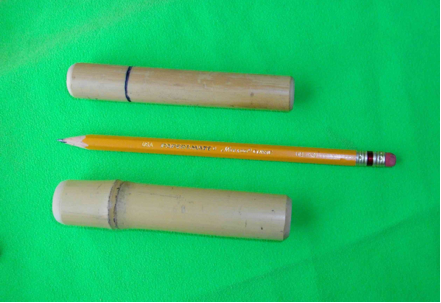 This is my standard bamboo tube that I have been using to this day (Fig. 2). 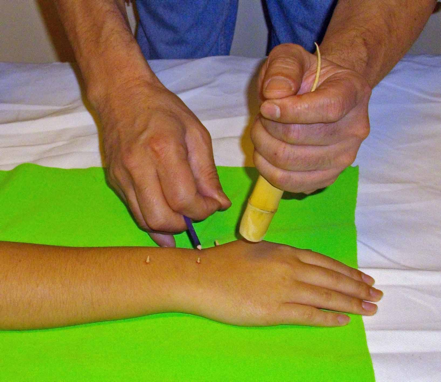 Later on I developed the thin bamboo tube, about 1cm in diameter, for extremely sensitive patients and children. Both ends of my standard bamboo tube can be used, but the 25mm end holds less air so the fire goes out sooner and the heat sensation is milder compared to the 80mm end, which is a bit hotter. Direct moxibustion is, of course, hot. And nobody likes moxibustion that feels too hot. The first difficulty of direct moxibustion, the heat sensation, can be overcome by using a bamboo tube. Fukaya Sensei calls these tubes “moxa heat reducing devices.” After the moxa cone burns down about half way, it is covered over with the 25mm short end of the tube. Appropriate pressure is maintained until the fire goes out inside the tube. Oxygen is cut off from the burning cone, and the fire feels like it fades out. This produces a unique and comfortable penetrating sensation into the body. The patient is first conditioned to the heat sensation with the application of one or two cones with the short end of the tube. Then the longer end of the tube is used for the rest of the cones. The second advantage is that the pressure of the tube feels good and creates a unique therapeutic effect. When the pressure is applied rhythmically as cones are burned inside the tube, the two stimulations of moxa heat and bamboo pressure are combined. This creates a comfortable vibration in the body and most patients relax. Some patients even fall asleep and start to snore. Direct moxibustion vitalizes the parasympathetic nervous system. The third advantage is that when the moxa cones are burned within the tube, a small “sunburn-like” burn is produced but, with a few exceptions, no blisters are formed. Even this level of burn, however, produces “denatured proteins” in the subcutaneous tissue. This activates antibodies and cytokene, and is thought to stimulate immune cells. The fourth advantage is that the effect of compression with the bamboo tube and the heat (the ultraviolet light from the burning moxa) are combined so that the vasomotion of the peripheral blood vessels is improved and circulation is increased. This has a dramatic effect in the reabsorption of inflammation and waste products in the body. Direct moxibustion is a natural antibiotic and anti-inflammatory agent. And also it is a very relaxing and comfortable stimulation therapy. I believe that the success of all treatment methods rests on whether “the patient feels comfortable.” Unless the moxibustion treatment is comfortable, the maximum effect cannot be drawn out, so my belief is that strong treatments that distress the patient are no good. Examining the skin of patients, we find some have a thick epidermis and others have a thin one. Those with thin skin easily get blistered or scarred with direct moxibustion. In my experience, however, except in special cases (as with suppurative moxibustion) blisters and scars have no special therapeutic benefit. Recently it has been proven that there are heat receptors in the corneal layer and epidermis, 1so there is no need to injure the dermis (the deepest layer of skin). The secret is to create a mild burn like a sunburn, and to keep the burn from the moxa as small as possible. I will list the guidelines for direct moxibustion below. When rolling the cones out between the thumb and index finger, do it as if leaving 1mm of space between them and avoid adding any pressure with the fingers. It is easy to see how the heat could range between 65 and 90 degrees centigrade just by the way the cones are formed. I use two pieces of wood to roll out a string of moxa. 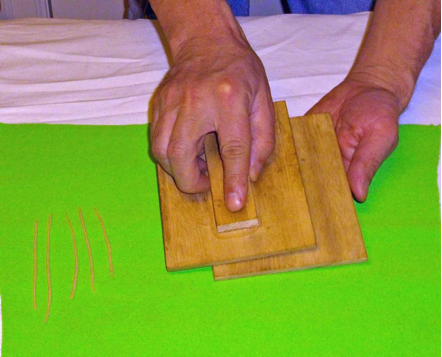 Use a small amount of moxa material, a bit bigger than an azuki bean, and place it between the pieces of wood and move them back and forth applying as little pressure as possible. This will produce a soft string of moxa about 2mm in diameter. The diameter is more uniform than when rolled by hand so it’s possible to reduce the heat sensation (Fig. 3). (2) Apply Shiunko2 after the points are decided. This protects the skin and prevents moxa scars. The Shiunko acts as an adhesive and the moxa cone stands easily on the skin. It is best to apply as little Shiunko as possible. Large amounts of this ointment on the point can hurt the patient because the heat builds up in the oil so the temperature goes higher than usual. (3) In direct moxibustion, the first cone feels the hottest, subsequent cones are not as hot because one gets used to the heat sensation. For the first cone use a small lightly rolled cone between the size of a sesame seed and half a rice grain. Applying subsequent cones is easy if the first one is light stimulation applied with a bamboo tube. The “ice breaker” is the most important. These are the basic guidelines for moxa application. 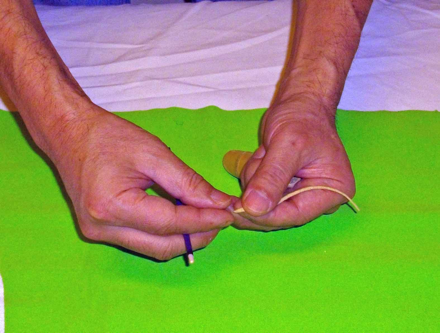 Pinch off a piece of moxa with the thumb and index finger of the right (dominant) hand and place it on the point (Fig. 5). The moxa is soft and delicate, so avoid crushing it by gently holding it and pulling it off to separate a piece. The part of the cone that is separated from the moxa string will have loose fibers and be shaggy after being pulled apart. Place the cone gently on the skin so as to get the end of these fibers to rest on the skin. Doing this creates a little space between the skin and the cone, and the heat sensation becomes even softer. Hold the incense stick between the index and middle finger of the right (dominant) hand and light the cone (Fig. 6). After lighting the cone let it burn halfway and then slowly cover it with the tube. Maintain appropriate pressure on the tube while you place another cone on the second point and light it. The first cone will have burned out, so slowly lift the tube off and place it onto the second point and maintain appropriate pressure. Repeat this process until it’s complete. When the bamboo tube is lifted off before the cone has burned out, the sudden influx of air makes the fire flare up, and this can cause sudden pain for the patient. So be sure to take the tube off only when adequate time has passed for the fire to burn out. The above four movements are smoothly repeated with both hands. Once you become practiced you will be able to apply about 10 cones using the bamboo tube every minute. It is said, “Acupuncture and moxibustion are like two braids in a rope.” I believe that even better effects are obtained by combining acupuncture and moxibustion. The stimulation of acupuncture basically works by the introduction of metal into the tissues and the ionic exchange that happens by the contact with metal. The stimulation of moxibustion, on the other hand, works by the invasion of tissue by burning and the production of chemical substances like histotoxins. These modes of stimulation are completely different in my experience, but they seem to have a complementary effect and do not counteract each other. Also it is easy to imagine how these modes of stimulation activate the defensive systems of the body. My treatments typically follow three steps as follows: First acupuncture, second moxibustion, and third multiple-cone moxibustion or deeper needling. I call the first step of acupuncture “preparing the ground.” The aim is to remove the superficial and excess tension and pain that are part of the complaint. By quickly “preparing the ground” on the surface level, it becomes easier to find the deeper tsubo (active points) that are a more fundamental expression of the disease or symptom. One might even say that I am fleshing out the epicenter of the symptoms. Seasoned practitioners are able to pickup the special points that express or represent the symptoms with just a quick sweep, and it’s possible to palpate moxibustion points this way. Having sensitivity in the fingertips makes all the difference. It doesn’t work so well, however, for beginners or people like me who are clumsy. This is why it’s necessary to “prepare the ground.” It doesn’t matter whether the needles are retained or not, but the parts of the abdomen, limbs, back, and head related to the complaints must be palpated to find Ashi points to stimulate lightly with shallow insertion. This softens the surface and brings a change. The feel of the tissue changes quite a bit when you re-palpate after this preliminary acupuncture. Therefore we must retaliate carefully to look for the “epicenter,” and find those points that are still tender or hypersensitive and launch a focused attack with moxibustion. This is the second step of moxibustion. The third step of multiple-cone moxibustion or deeper needling is used when the symptoms are deep and serious. After completing step two, have the patient get up and move around a bit. When the symptoms are still the same, have the patient point out the problem areas and target one or two points with non-retained deep needling, or otherwise apply 7 to 10 cones. This third step is effective for conditions like acute pain, but normally I skip this step. You may think this sound like a lot of work and stimulation but in my experience, with the exception of extremely deficient patients, the combination of shallow needling and bamboo moxibustion is never a problem for patients these days with normal strength. I even believe that doing moxibustion after acupuncture actually softens the tension that may accompany the acupuncture. I don’t do acupuncture on extremely deficient patients like those with terminal cancer, but instead I judiciously apply moxibustion adjusting the cone size and number according to their physical condition. For such patients I use only moxibustion based on Sawada’s Taikyoku Therapy. Painless and comfortable bamboo tube moxibustion brings the parasympathetic system into dominance, improves circulation, and relaxes the patient. This is why I believe moxibustion is originally meant for tonification. What is interesting is that even multiple-cone moxibustion can sometimes serve as tonification. Dispersion technique does exist in moxibustion. In cases of acute pain like appendicitis, multiple cone moxibustion can be useful for quickly alleviating the pain and inflammation. I consider this to be dispersion technique. Sometimes the patients reaction to moxibustion is unimaginably strong, so it is most important to proceed carefully considering the patient’s symptoms, age, experience with ace-moxa, constitution, and strength in order to adjust the dosage (number of points, number of cones, and amount of heat). Various reactions to overdosing with direct moxibustion have been often mentioned in the past, and these include fever, fatigue, heaviness in the head, flushing, loss of appetite, nausea, and diarrhea. When I examine the moxibustion points at the end of the treatment, because these points are a reflection of the patient’s condition, I can confirm the sho or pattern of the patient. Using these patterns as a clue for subsequent treatments, I find that the moxibustion points change, move, and diminish with time. In other words, patients get closer to health. In this way my treatment are very simple and inductive. Instead of specifying the essential character of the disease in the beginning, I read the living phenomenon of each body and track its changes. Obviously the way I read the body owes a great deal to the vast experience and knowledge of Sawada Sensei and Fukaya Sensei. The great masters Sawada Sensei and Fukaya Sensei are as different as different can be. Sawada Sensei viewed the body as Sanjiao (Triple Burner) and sought to balance the Zangfu. He based his work on classics like the Nanjing (Classic of Difficulties) and the Shisijing Faun (Elaboration of 14 Meridians) and used the Five Phases Chart. In addition to his standard points, he used some special effect points, so essentially he did a whole body treatment using many points. Fukaya Sensei was 23 years younger than Sawada Sensei and he used famous moxibustion points and got an effect with just a few points. His work was based on Hangdog Mingtang Jiujing (Yellow Emperors Bright Hall Moxibustion Classic) written by Dou Guifang in 1311. He also applied his knowledge of Western medicine. He said that “Moxibustion doesn’t work, you make it work. Use special points to draw out the effect.” The thing these two masters have in common is that they used “living” or active points. There is a saying in the classics, “Make the painful point the treatment point.” This refers to places where there is a sensation with pressure. When moxibustion is applied to points like this, there is a reflexive change in circulation. Further the heat of the moxibustion induces reflexive changes all over the body. This is not limited to the digestive and circulatory systems, but reaches the immune and endocrine systems as well as the autonomic nervous system. At the same time the point that receives the moxibustion naturally shows changes. Indurations soften, and swelling is reduced. Cold parts warm up and depressed places begin to fill up. Direct moxibustion has an effect on both excess and deficient manifestations, and serves to normalize them. It can be said that it “evens up” deficiency and excess. This is all a result of improved circulation. 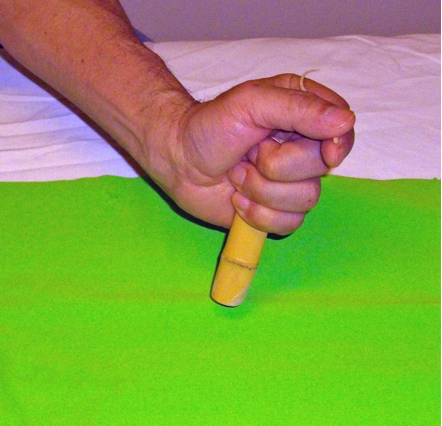 When pressing over points with a bamboo tube the changes in the points can be felt in the hand applying the pressure. Indurations start to melt and the tube presses in deeper. Places that are soft and flaccid start to feel more firm as blood collects and the tissue gains tone. The effect of treatment can be assessed by feeling the changes around the point and in the tissue through the bamboo tube, and this is one of the merits of using a bamboo tube. These days some patients are on a lot of drugs so there is no reddening of the skin or increase in skin temperature with direct moxibustion. This is because the chemicals become waste products in the body and stagnate in the blood vessels and tissues. This state of pollution makes it so the body doesn’t respond with moderate stimulation. Patients like this take about five times as long to treat, and moxibustion must be applied very patiently. Then eventually changes begin to appear on the body surface. Moxibustion is not difficult. It often happens that I teach patients to do moxibustion and they go home and apply it overzealously but still end up curing themselves. The heat stimulation of moxibustion has a mysterious effect. Direct moxibustion has no side effects and is a therapy with broad applications that anyone can do. I believe that direct moxibustion activates the functions of the body, improves one’s state of health, and even enables a person to become rejuvenated. 1. Denda Mitsuhiro, Hifu wa Kangaeru (The Skin Thinks), Iwanami Kagaku Library, Vol. 112, pp. 45-47. 2. Shiunko is an ointment formulated by Hanaoka Seishu, and is famous as a balm for injuries and burns. The original formula is made with sesame oil, but I use my own variety with olive oil. Mizutani Junji, L. Ac. Graduated from the Japan Central Acupuncture College in 1983 and was licensed to practice shiatsu, acupuncture, and moxibustion in Japan. He moved to Toronto in 1984 to further his training at the Kikkawa Shiatsu College. Subsequently he taught courses in Oriental medicine at the above school as well as the Shiatsu School of Canada. He also served as the president of the Shiatsu Therapy Association of Ontario for three years. He moved to Vancouver in 1992 where he currently has his practice. He is the founder and director of NAJOM.